Marine bird survey was conducted as part of research on biodiversity conservation close to the inner border region of Goseong County along the Daejin-Geojin coast on April 20th and 21st; and again on May 11th and 12th. Survey conditions were good during both survey periods with light to moderate winds; calm to moderate seas (though with 2m swell on May 12th); and high to excellent visibility. All bird survey was conducted by Dr. Nial Moores (though see below). These were the eighth and ninth surveys of this area conducted as part of this collaborative project between Birds Korea and the Hanns Seidel Foundation (Korea), with previous surveys conducted in 2015 on June 24th-25th, September 3rd– 4th, November 11th-13th, November 20th-22nd and December 15th-20th; and in 2016 on January 13th-14th and March 15th-17th. 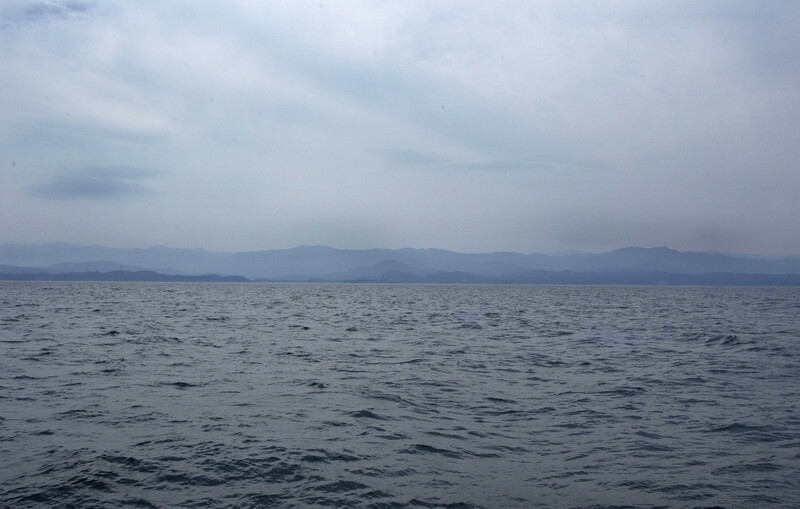 Boat-based survey (on April 20th and again on May 11th for approximately four hours, 2-5km out, following the coast off Geojin headland and then east out to about 8-10km offshore north towards the NLL and then back about 3-4km offshore to Daejin harbor). During the boat-based survey, with counts divided into continuous ten-minute segments, NM was supported in April by Professor Robin Newlin and Dr. Bernhard Seliger (spotting and recording images) and during both surveys by Ms./ Dr. Choi Hyun-Ah (HSF), who plotted the boat’s course at the same ten minute intervals. The boat was captained by Choi Yong-U. Counts of birds along (most of) the coast from just north of Daejin Harbour to southeast of the Geojin headland, a distance of approximately 8-9km of coastline/ inshore waters along which birds were visible through the scope. In April and May, because of high visibility, these counts were conducted from approximately 16:00-18:30 along Geojin Headland; from January Pension south of Daejin Harbour; and in the morning between 08:45 and 10:15 from the lighthouse north of Daejin Harbour. Some areas were also checked from the boat to detect presence or absence of birds. Counts of birds made from the January Pension (south of Daejin Harbour) which were moving along the coast for two hours starting 15 minutes before sunrise (e.g. 0516 in Gangneung on May 12th). 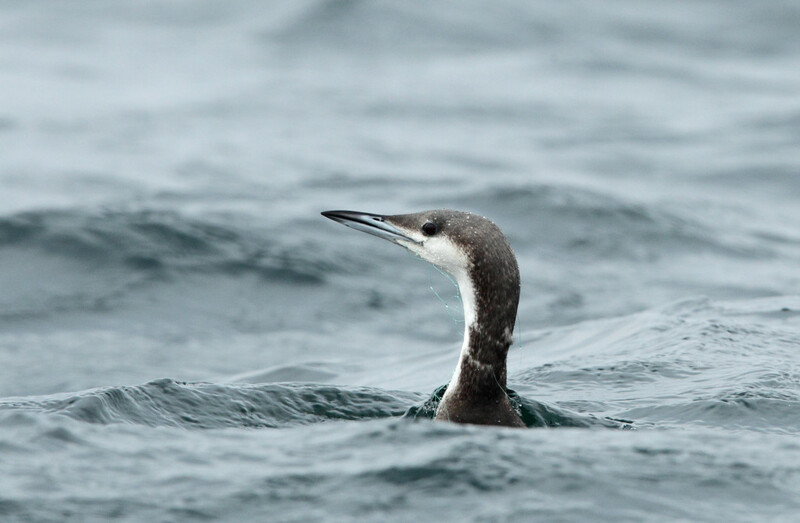 As expected, the total numbers of birds that were recorded in the study area decreased from the mid-winter peak to March and again from March into April and May, largely due to the emigration of wintering Pelagic Cormorants, gulls and alcids (especially Ancient Murrelet) and most grebes. In addition to gathering important information relevant to understanding migration phenology, the most notable bird observations during the April and May surveys were large numbers of loons into mid-May, when most loons are generally thought to have departed Korean waters by late March; a single (or perhaps two?) Spectacled Guillemot in mid-April; and several Rhinoceros Auklet into mid-May. 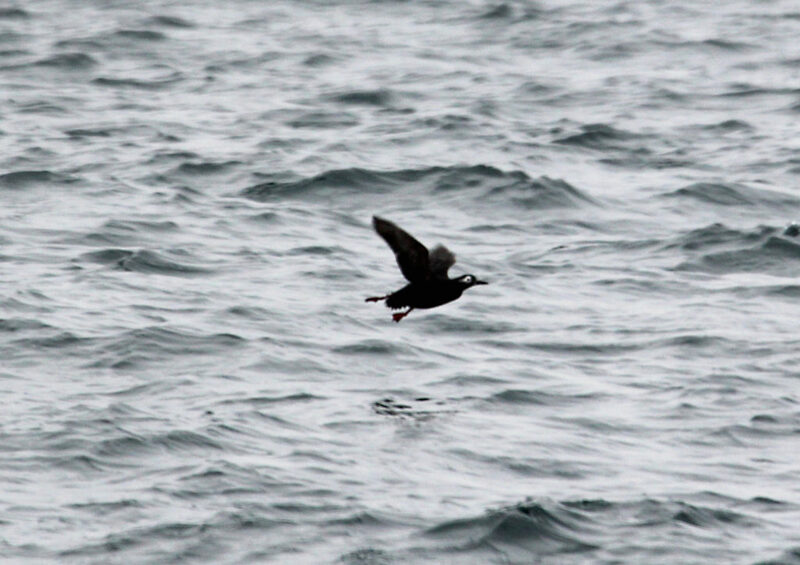 These records appear to be the latest observations of either of these two latter species in ROK waters known to Birds Korea and raise the possibility of breeding in Korean waters, perhaps even off northern Gangwon Province. Austin’s review of the Birds of Korea (1948) describes Spectacled Guillemot as “resident on the east coast” of Korea with specimens collected in late April from the “Kuk Islands, in the northern part of (Gangwon) province where it probably breeds, though there is no evidence to that effect. 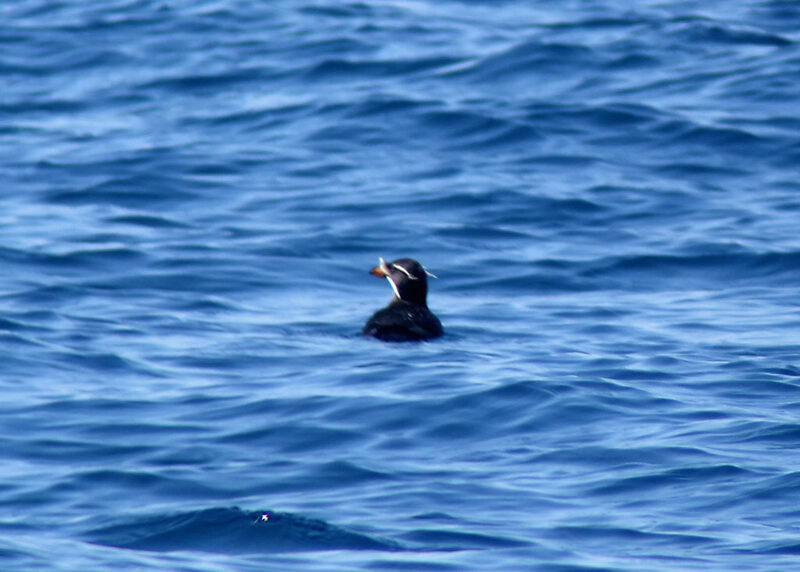 However, it does breed at Ran Island, in northeastern Hampyong Pukto..”; and also described the Rhinoceros Auklet (then known as the Hornbilled Puffin) as a “summer resident off the northeast and west coast”. Many of the loons seen on May 11th from the boat were in active body moult; and a very few (<10) appeared to be in primary moult. The largest concentration (a single flock of at least 550 Pacific Loon) was very close to the marine border. Although impossible to confirm, it appeared that the flock extended more or less unbroken into restricted waters (and if so, might therefore have contained thousands of birds). A second smaller flock was off the headland. More research is required including communication with loon researchers to understand more about migration strategies. However, it seems likely that these loons are using the Goseong coast as a final less-disturbed staging area before prolonged flight overland to nesting grounds (both Arctic and Pacific Loons nest far to the north of the Korean Peninsula). Also of note, a River Otter Lutra lutra was seen swimming past the January Pension at dawn on April 21st and two Minke Whale Balaenoptera acutorostrata were seen from the boat very close to restricted waters on May 11th. Identification was based on size, of one estimated at about 5m and of the other as perhaps 7m; and in both on the contrast between a pale grey stripe rear to the flipper with an otherwise dark upper body; on a diagnostic pale stripe on the front flipper; and on the hooked or sickled shape of their dorsal fins. A whale, presumably one of the same two Minkes, was also seen at some distance from shore on May 12th. 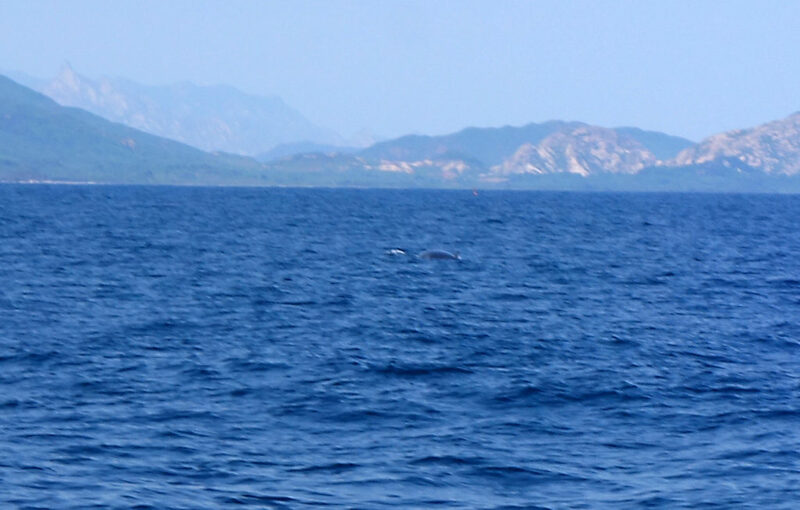 Although local fishermen claim that there are large pods of dolphins (numbering several hundred individuals) in the sea off Goseong, these are the first cetaceans I have seen here. As noted previously, by design there is much overlap between the count areas (with many of the same birds therefore likely being counted twice or even three times during the different count efforts). As in previous surveys, only the highest count of those birds that were likely double-counted are included in the minimum estimate presented in the table below. An asterisk denotes allocation of “loon sp” to either Pacific or Arctic Loon based on the ratio of identified individuals. 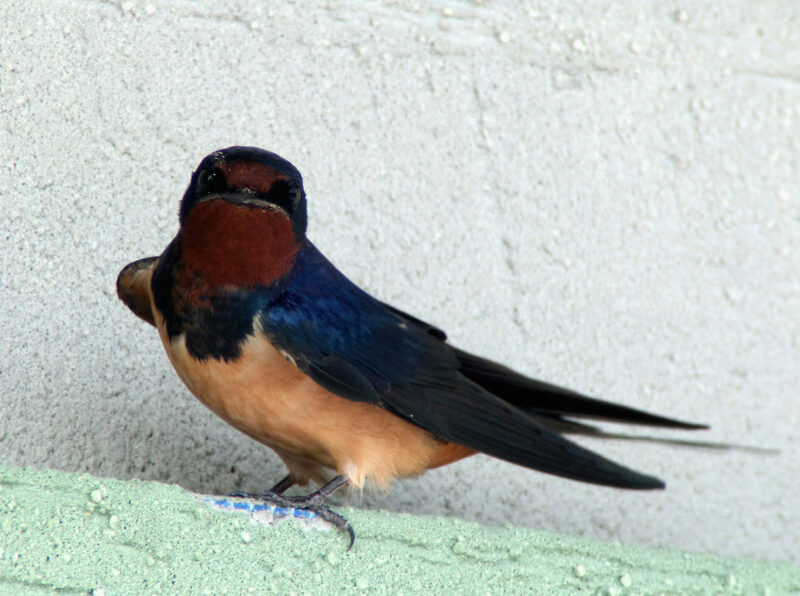 A few landbirds were also noted during the survey, with most notable a small group of perhaps up to eight Red Crossbill seen briefly on the Geojin Headland on April 20th and a richly-coloured Barn Swallow, presumably of subspecies saturata, nest-building in Daejin on May 12th.